Rod Taylor sustained a sudden and fatal heart attack on July 5th at his beloved Woodbury Ski Area in CT.
An enthusiastic and flamboyant supporter of Masters Ski Racing, Rod battled his way down Masters’ race courses for almost two decades, consistently medaling in both SL and DH at Regionals and Nationals. A world-class athlete, he occupied a spot on the US A-team from 1968 to 1971, racing World Cup along with the likes of Tyler Palmer and Hank Kashiwa. He was named US Downhill Champion and won Aspen’s famed Roche Cup in 1970. Rod went on to race on the World Pro Skiing circuit at its highest point, competing against Bobby Cochran, Otto Tsuchdi, Henri Duvillard, and his best pal; Spider Sabich. In a pile of photos and press clippings I found a candid polaroid signed: “Rod – To the most exciting person I know – Jean-Claude Killy”. 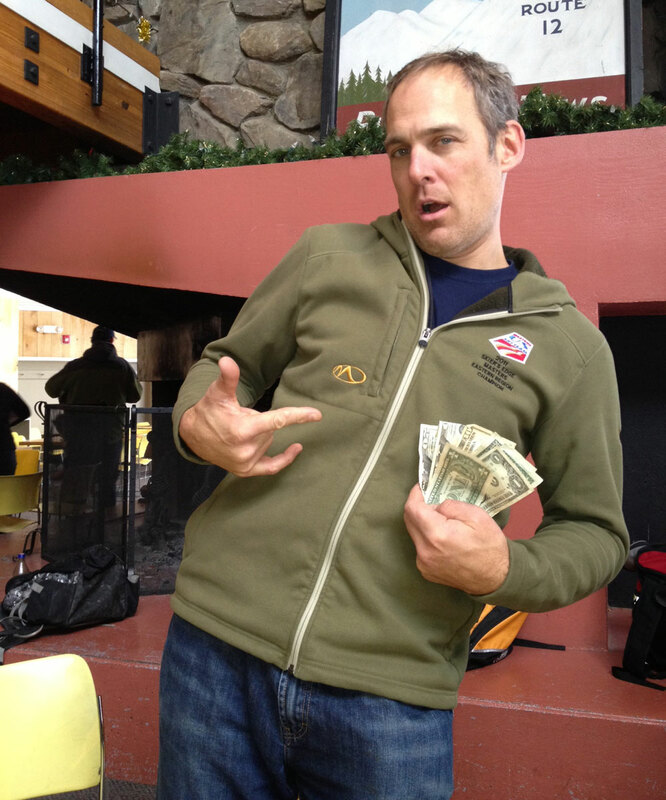 Rod came to ski racing late, but his first race is legend. He tore up a sheet, sewed white stripes down the sides of some black stretch pants, grabbed his skis and a football helmet and hitchhiked to Cannon Mountain. Running with bib number 200-and-something, he came in 11th. The result was noted by a scout and on Rod went to the US team; three years later he was running in the Hahnenkamm. Everything about Rod was BIG; big guy, big ego, big dreams, big competitive streak, big optimism, big, (sometimes questionable) outfits, big talent, big mouth, big innovator, big presence, but mostly big heart. He loved to promote, mentor and encourage skiing on every level. At Masters’ races Rod would always drop by the women’s start often in a zebra speed suit, and cheer us on with his trademark “Let’s go Big Timer!” In his own races he went crazy fast, approaching each course with glee and great gusto. Being organized was never a concern for Rod. He thought nothing of jumping on a plane to head to Nationals without having skied all season. He would charge into a parking lot at a race, stuff falling out of his vehicle, and slam his dangling speed suit sleeves in the car door. In the hurried trudge across the parking lot, he’d probably lose his goggles and at least one shin guard. If he forgot something important he’d make do, as long as he got his race in. Details didn’t faze him. Twice I found his wallet lying somewhere in a starting area. Once I found his car keys, another time the key to his hotel room lying in the snow. Rod was incredibly strong – whether muscling his way down a SL, fighting big air in a DH, flinging willing and unwilling partners across a dance floor, taking out the sidewalls of a tennis court while jumping for a shot, or urging a horse over a solid and imposing stone wall on a hunter pace, to the absolute horror of his equestrian, saintly and stoic wife Carolyn. When he tore an Achilles heal, he opted to “let it heal on it’s own”. He was never a drinker and an ibuprofen made him dizzy. Rod’s passion was directed towards Carolyn, (“Honey gotta get to my start- you can get down to the finish area from here, later!” – he left her teetering at the top of “Jaws of Death”), and Woodbury Ski Area. We never called it Woodbury Ski Area, it was simply “Rod’s Place”. Rod took every opportunity to bring fun and love of sport – any sport – to his place in the northern hills of CT.
“Woodbury, Home of Big Powder” was his standard line on an incoming call. In the summer, at the high point, his Reggae Fests drew thousands to perch on his hill. Rod made videos of the concerts and would head into the city to sell them on 42nd Street – at night. Skateboard parks, and huge into-the-water ski jumps have beckoned high-flyers from around New England. In the latest Woodbury brochure glamorizing the “15 runs” of the area, I was surprised he didn’t offer heli-skiing off the back bowl. In winter, the area has been a mecca to snowboarders, boasting one of the first half-pipes, a terrain park where shovels were left on the hill to encourage jump building, and many ‘Big Air” contests. Then came expansion and tubing -12 tubing runs providing various degrees of excitement. Before Rod died, his latest addition was zip-lining, both summer and winter. Up to 5 or 6 high school teams trained at Rod’s every ski season. Many kids made their racing “bones” on the hill at Woodbury. Masters racers were always welcome. Grab a drill, a wrench, some gates and have at it. “Oh, and this is how you turn on the lift”. A great slalom hill, there was however some competition for space in the earlier years. At that time, anything you could wrestle to the top was a go for the descent. I was running SL once and a bicycle with studs on the tires went flying by through the adjacent half-pipe. Another time, crusty, bearded men of dubious age wearing flannel shirts, jeans, and work boots with steel scrapers riveted to the toes, scorched me as they practiced for a 90mph downhill on Flexible Flyers. Training one New Years Eve, I leaned over to wrench in a gate and felt the apparent wind created by a blue and white ticked mattress full of revelers skidding by at about 30mph. Forty-three Masters Regional and National medals hang in the “office” at Rod’s place. When you look up that hill you can imagine Rod pummeling his way through a SL course, goggles askew and shin guards flying every which way but clocking a very fast time. He doesn’t pause at the end of the course before getting huge air off a jump, over-shooting, and landing on the flat with an ear-splitting THWACK- grinning from ear to ear. So long Big Timer, gone too soon. Our Very Own Bill McCollom’s New Book is Available Now! 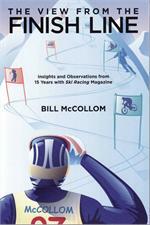 In The View from the Finish Line you can relive highlights from Bill’s fifteen years of writing for Ski Racing magazine! Remember all the exciting ski racing moments from Bill’s perspective, including stories about everyone from Al Sise to Bode Miller. If you are quick, you can even get Bill to sign it at a Masters race! Racers get your teams set! The 2014 edition of the Hochgebirge Challenge Cup is upon us! That’s right, think good food, awesome costumes, fast skiing, crashes & PRIZES!! 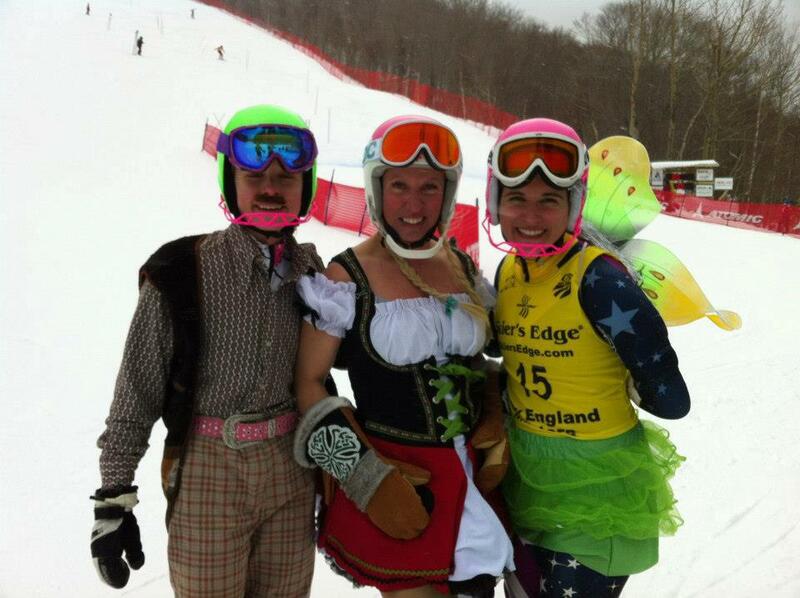 Race is a slalom (one of the most exciting on the Sise Cup tour) held at Cannon Mountain, NH on Saturday Feb 22, 2014. While this race is part of the New England Masters Sise Cup Series it is also a team race. 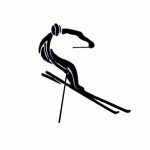 This harkens back to the early days of alpine ski racing (the race was first run in 1931!!) when team racing was an important component of competition. Teams of four can be registered the morning of the event at the bottom of the race hill. Team fee is $20 and teams can be made up of any mix of ages and gender. Teams comprised of four ladies may compete for the Harding trophy…teams of four gentlemen or mixed composition can compete for the Hochgebirge Challenge Cup. There are also age group awards with teams being entered in the category of the youngest member of the team. 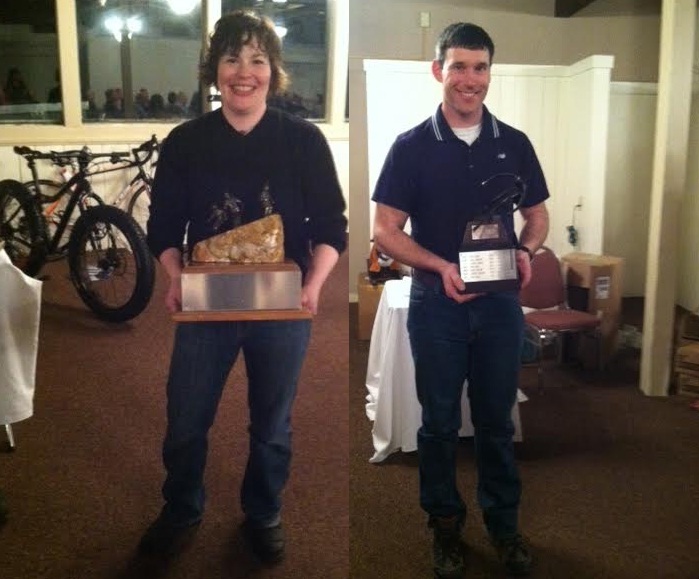 Awards will be presented at the Hochgebirge “Hilton”…with raffles and history/ski racing trivia by the fire. Dinner is available and refreshments offered. Don’t forget, the best costume wins an awesome prize!! So bring your best duds and get voted #1 by your fellow NEMSies!! 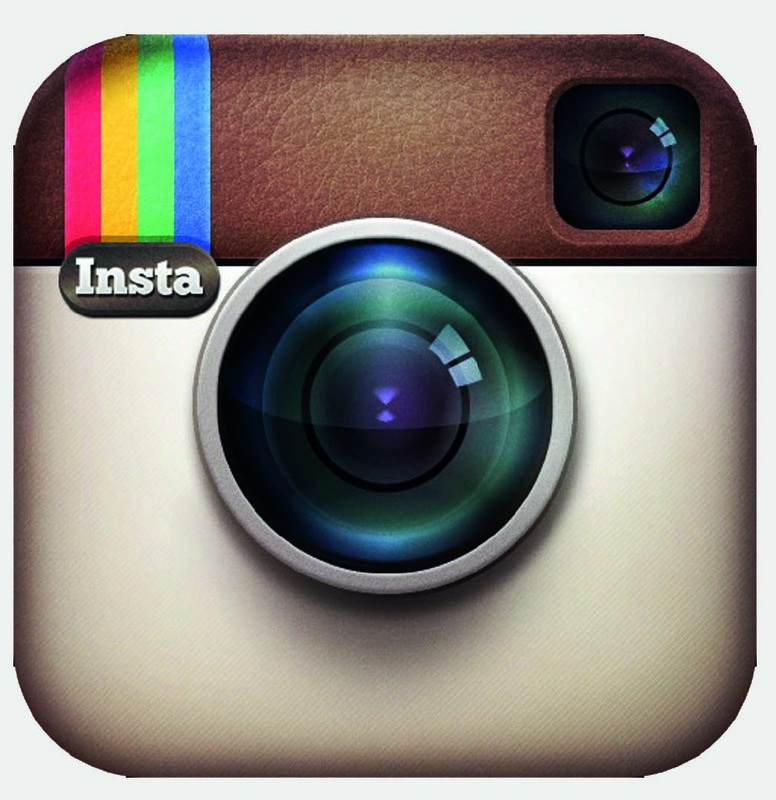 AND…There will be a pair of 192 Bomber GS Race skis with a 27m radius from Artech up for raffle as the Grand Prize!! Additionally the Sandra Bolduc Award for Questionable Skiing Behavior will be awarded for just that. Racers may also check out the KHS Flite 720 road bike that will be raffled at the Sise Cup finals at Waterville Valley in March. Don’t miss this!! Thanks to our sponsor Artech, NEMS raffled off a pair of Bomber World Cup race skis at the Cannon awards. Steve “Big Red” Masur was the winner, proving again this year he’s not only smoking fast, but he’s also lucky! !